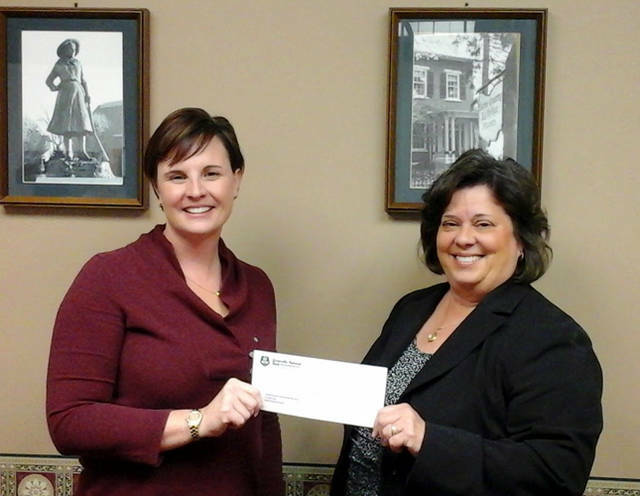 Gloria Harpest of Greenville National Bank is pictured with Andrea Jordan, executive director of the Darke County Center For the Arts. Greenville National Bank is a sponsor of the sold out DCCA Artists Series show Piano Men – A Tribute to Elton John & Billy Joel, at 8 p.m. Saturday at St. Clair Memorial Hall. GREENVILLE – Darke County Center for the Arts recognized Greenville National Bank as a Spotlight Sponsor of the sold out Artists Series performance of Piano Men – A tribute to Elton John & Billy Joel on Saturday at St. Clair Memorial Hall. “Piano Men” also is sponsored by Coppock-Hole Trust and The Advocate & The Early Bird Newspaper. The Ohio Arts Council helps fund this program with state tax dollars to encourage economic growth, educational excellence and cultural enrichment for all Ohioans. Patrons are reminded that parking is available at the new parking lot at the site of the now-demolished junior high building, including four handicap-accessible spaces just outside the now readily accessible entrance on the west side of St. Clair Memorial Hall; the lot can be entered from Armstrong Street and Central Avenue. Joan Ellison sings Judy Garland with the Toledo Symphony on May 11 for the final Artists Series performance of DCCA’s 2018-19 Ruby Celebration Season. Guests are invited to forget their troubles, come on, get happy as Joan joins the Toledo Symphony Orchestra for a special performance in celebration of Darke County Center for the Arts’ Ruby Anniversary. Featuring Judy Garland’s original arrangements brought back to life, guests will hear her biggest hits from Hollywood to the concert stage, including “The Trolley Song,” “Zing! Went the Strings of My Heart,” “That’s Entertainment,” “Get Happy,” “The Man That Got Away” and, of course, “Over the Rainbow.” Tickets are $35 and available now online and through the DCCA Office. DCCA presents and promotes performing and fine arts encouraging cultural enrichment. For more information on DCCA the 2018-19 Ruby Celebration Season, contact the DCCA office at 937-547-0908 or visit its website, DarkeCountyArts.org.